Marchionne: "I have not slowed down one single dollar of spending in the United States." AUSTIN, Texas (Reuters) -- Chrysler Group CEO Sergio Marchionne said there was "no need" for the automaker to follow its larger U.S. rivals in offering white-collar pension buyouts. Both General Motors Co. and Ford Motor Co. said they will offer pension buyouts to white-collar retirees this year. The strategy will lower the automakers' outsized pension obligations, which rose to record levels in 2011 and have been a major concern for investors, analysts said. Ford will extend its offer to 98,000 people, while GM will approach 42,000 about swapping their monthly pension checks for a one-time lump-sum payout. "There's no need for us to do it," Marchionne said of the buyouts during a visit to a Fiat dealership in Austin on Monday. He did not expand on his comments. A growing concern for decades as U.S. automakers lost market share to foreign-based automakers in their home country, pension costs became an albatross for the U.S. industry with the sector's downturn five years ago. Chrysler ended 2011 with a nearly $32 billion pension obligation and its pension plans were underfunded by $6.5 billion, according to its annual filing. The company's market value was around $7.5 billion at the end of 2011. Chrysler has just over 130,000 retirees. About 30,000 are former employees who were paid an annual salary while the rest are retired hourly workers represented by the UAW. 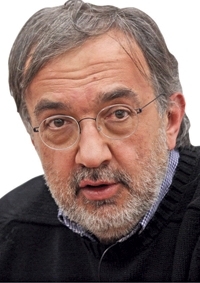 Marchionne, who is also CEO of Italian automaker Fiat S.p.A., has been at the helm of Chrysler since the U.S. automaker emerged from the brink of collapse before its U.S.-funded bankruptcy in 2009. At that time, analysts said Chrysler would hold Fiat back, but in the last three years, the U.S. automaker has been Fiat's main source of strength as Europe's auto market weakens. Chrysler sales in the United States have jumped about 30 percent while the overall U.S. auto market has risen 13.4 percent during the first five months of the year. Fiat has delayed the launch of its Bravo and Grande Punto cars to 2014. By contrast, Marchionne has not slowed spending on vehicle development in the United States. "I have not slowed down one single dollar of spending in the United States," Marchionne said. "As a matter of fact, I've probably accelerated it in the last six months." A sharp slowdown in jobs growth last month raised fears on Wall Street that the U.S. economic recovery may be foundering. Marchionne said the pace of the economy is slow, but there would not be an economic contraction. "If I have any concerns about the U.S. it's the potential impact coming from Europe, but it's not from internal issues," Marchionne said.